You can order this same package without the case by going to our 38LRX Rifle light with 1-4 colors and then choosing the appropriate options. Size = 1.65 inches across the head, 1 inch tube, 5.5 inches long when in flood beam and 6 inches long in spot beam. Run times: Red and IR = 2.5 hours at full power with almost no dimming, Green and White = 2 hours with almost no dimming and then another two hours with the light slowly dimming over that time. Distances in yards each color will shine, Red = 352, Green = 384, White = 527. Below are a couple of video's to show you how easy it is to change the color of the 38LRX, 50LRX and 66LRX light or convert to a different model. 1 - 38LRX Rifle light with remote wired Eliminator switch. Eliminator switch has two buttons on it, one button turns the light on half power and the other full power. ----The Eliminator switch works both as a pressure switch and a on/off switch. 1 - LED module in your choice of color(Red, Green, IR, White). The LED module color determines the color of light your light will emit. Choose in the options above. 1 - 18650 Battery Charger with USB plug, AC and DC adapter plugs. 1 - Height adjustable Quick Release mount. 1 - Quality Aluminum case with custom cut EVA foam. 5 years on housing and LED, 2 years on any mounts or switches, 1 year on batteries and charger. Fast focus, go from full flood beam to full spot beam in about 3/4 of a turn of the head. Will mount to a 35mm, 30mm or 1 inch scope tube or weaver/picatinny rail with our Height adjustable Quick Release mount included in this package. Runs on 1 18650 battery. the spot beam that it washes out the pigs until we focus the beam to a wider beam. You can easily see in the video how you can go from a spot beam to a flood beam. This is a great light for hunting for those that don't need to see extremely long distances that our 50LRX and 66LRX shine. 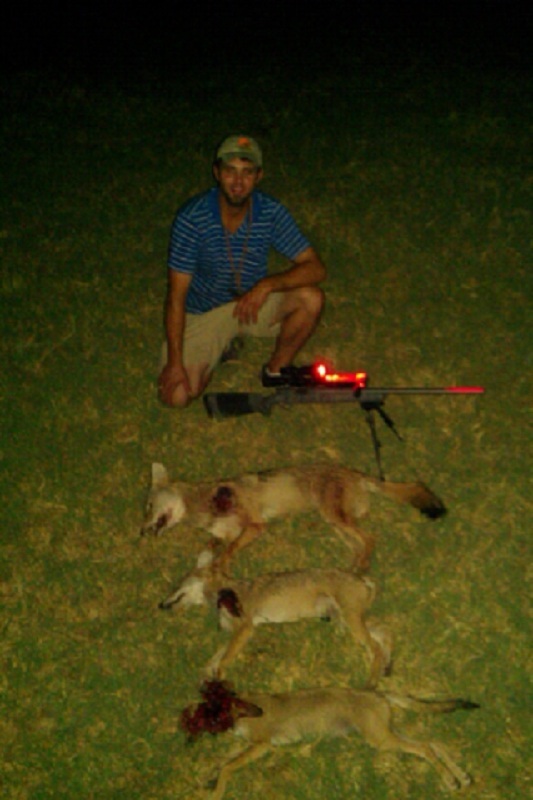 Works great for hunting Hogs, Coyote, Fox, Racoons, Bobcats and more.